Check back soon for our 2019 dates! Thank You For a Perfect Weekend! Our Balloons Over Morgantown event concluded with every single launch and event happening. We don't think there's ever been a year when we've managed to have every single launch go. But the fate was on our side this year and we had perfect flying weather everyday. We hope that many of you were able to join us for the launches or saw the balloons floating over Morgantown. We'd like to thank all of our sponsors for helping to make this event possible. We'd also like to say thank you to our pilots and crew for filling our skies with beautiful balloons. It's always a pleaseure to see everyone and we hope that you can all join us again next year! We'd also like to thank our staff for their hard work and also our amazing spectators for coming out to see us! Thank you also to the local landowners who were surprised by balloons landing in their backyards - we appreciate the landing space and the help in packing up our balloons! We look forward to seeing you all again next year for another Balloons Over Morgantown Event! Successful NightGlow and First Launch! We'd like to thank everyone for coming out to or NightGlow at the Morgantown Mall last night! The weather was perfect and we had an amazing event! Thank you so much to the mall for everything they did to help us get ready for the event! Thank you also to our staff, pilots and crew for all the hard work they put into the evening. We'd also like to extend our thanks to the Westover Police Department for helping with traffic and to Wong's Wok for supplying our pilots and crew with food after the event! This morning we had fantactic weather again and we got our first launch off without a hitch! 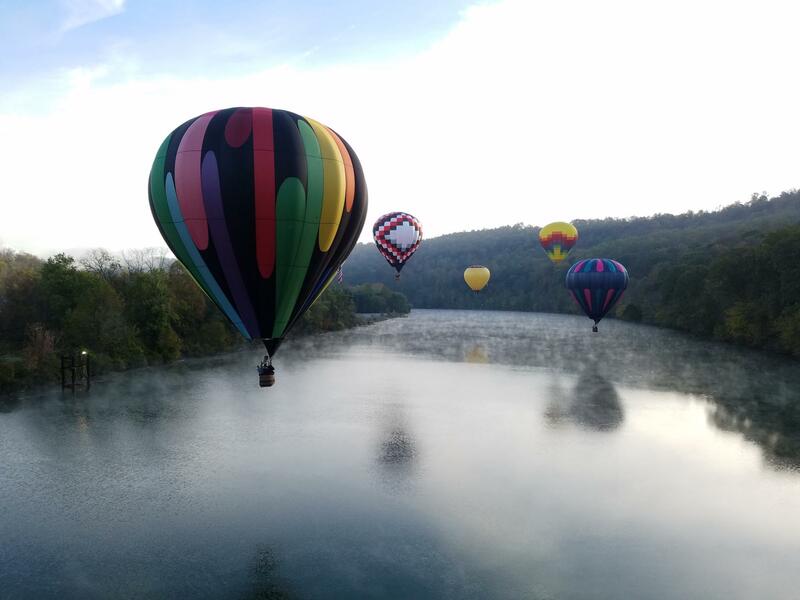 We hope you had a great time watching the balloons inflate and drift off towards Cheat Lake. We'll see you for another launch around 4pm this afternoon at the Morgantown Aiport! Remember all launches are weather dependent. Balloons over Morgantown is almost upon us! This year we are expecting 14 balloons, 13 of which will be here for NightGlow. The NightGlow will be held on Thursday, October 19th at the Morgantown Mall. 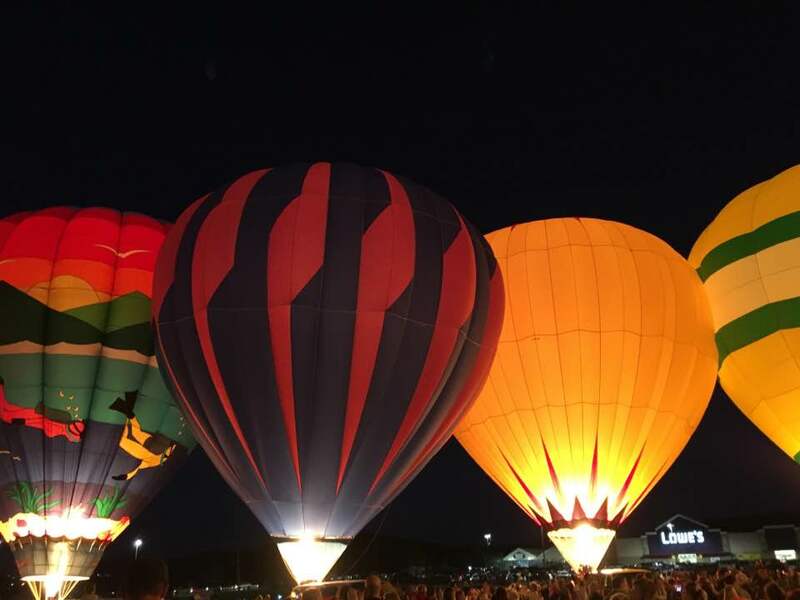 The official time for synchronized glow is 6:30pm but we recommend you arrive early to watch the balloons inflate and to allow time for parking and traffic. Our balloon launches will all leave from the Morgantown Airport near the main runway. Our launch times for the weekend are Friday, October 20th at 8am and 4pm, Saturday, October 21st at 8am and 4pm and Sunday, October 22nd at 8am. All of our events are weather dependent and the times are approximated. For more information please view our Schedule Page and FAQs page. We'd like to thank all of you who turned out in the early hours of the morning for our last launch of the weekend. Unfortunately, there were strong, high winds in the upper elevations and we had to cancel the launch. Conditions like that can be very dangerous for balloons and it isn't worth the risk. However we're thrilled with the outcome of the weekend and we got three beautiful launches! We hope you all enjoyed seeing balloons over Morgantown again. We loved seeing all of your pictures and it looks like lots of you were able to get close and personal with the balloons. We wish all of you and our pilots a safe journey home and we look forward to seeing all of you next year! We'd like to thank everyone for coming to our Saturday launches! Today was a perfect flying day and both launches were a great success! Our morning launch heading out towards Point Marion and our afternoon launch went out over Canyon Road and Cheat Lake. We hope you all enjoyed seeing the balloons in the air and we loved seeing the pictures you shared with us on Facebook! Our last launch for the weekend will be Sunday morning at 8am from the Morgantown Readiness Center. Although the fog didn't cooperate, Friday evening turned out to be a beautiful night for flying! All of our balloons launches and we had Balloons Over Morgantown again! The balloons traveled in the direction of Sabraton, Greenbag Road and the Kingwood Pike. Thank you to everyone who sent in their pictures of the flight! We hope you all had a great time seeing the balloons in town! Our next launch will be Saturday at 8am from the Morgantown Readiness Center. We arrive this morning to find the airport covered in fog. We really hoped that it was going to burn off in time for our flight but no such luck. The airport itself cleared but the estimated landing area was still covered in fog, which means our pilots would have had to land blind. Our intrepid weatherman, Todd Fisher, even took his little fixed wing plane out and confirmed that the landing area was a no go. Luckily he was able to depart and return from the already clear airport. Rather than risk a blind and potentially dangerous landing we decided to go ahead and cancel this morning's launch. The weather for the afternoon looks beautiful, though, and we hope the 4pm launch will go off without a hitch! We hope to see you there! Remember launches are from the back of the airport near the Morgantown Readiness Center. See you soon! Last night we were thrilled to open our ballooning weekend with NightGlow! We'd like to thank all of you who joined us last night and we hope you had a wonderful time! Unfortunately, the wind picked up a little in the valley and our balloons were getting tossed around which led to an early end to our evening. It was disappointing to cut it short but the safety of our spectators and our pilots is our top priority! We were very sorry to hear that some of you were unable to make it in time. We hope that you'll be able to join us for one of the launches this weekend! Remember all launches will be from the Morgantown Readiness Center located on Army Band Way. We'd also like to once again thank WVAQ for providing music for the NightGlow, Hagedorn's for providing propane and Mylan Park for hosting us there.